The Knight of Swords. 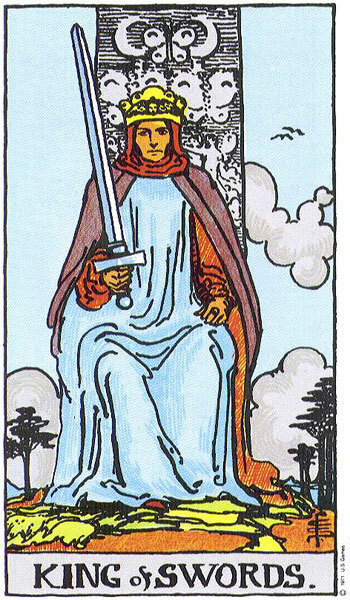 In the Rider-Waite tradition, this is the King of Swords. This card represents the personality that results from the meeting of Fire and Air; this card is then the Fiery aspect of Air. It is the fiery, passionate ideology that can consume one’s entire personality; the card that results from Cruelty and leads toRuin and martyrdom. This card represents the personality associated with a passionate ideologue. The person who exemplifies the Knight of Swords is Intelligent, Clever, andSubtle; he is a Manipulator. He is at the same time Delicate and also veryFierce when his positions are challenged. He is Skillful, and is constantly moving forward; he represents Violent and Managed Motion; he fights for drastic changes that are heavily monitored. He is a proponent of Science and Logic. At times, though, he can be Incapable (reality can often shatter a philosopher’s ability to function capably when his ideas do not work) and Indecisive – he has a general plan, but the details aren’t fleshed out. He deals with and isDriven by Ideologies, not practicalities. He is willing to give his all to his cause, and so is prone to Martyrdom. His is the world where action meets thought; he has a vision of the world as it should be, and he seeks to make it that way. The Rider-Waite art shows a King sitting on his throne. He has the detached air of someone prone to deep thought, yet also seems ready to act; he is a thinker who will act on his beliefs when necessary. His face is stern and appears to be willing to pass judgment on others. The Thoth art has a more dynamic image; a swiftly moving man with dragonfly wings on a steed, flying amongst the birds graces this image. He has a thin sword held forward; he pinpoints a problem and tries to fix it. He is also focused on his one issue of thought, and ignores what else is around him. This card in particular captures the idea of violent and managed motion. he also has the air of one leading a charge to his inevitable doom, reflecting the theme of martyrdom. In a reading, this card asks you to examine the role that this personality may play in your life. Do you know anyone devoted to their ideology, who will do anything to promote it, and isn’t above manipulating others to get things to be the way they feel things should be? Are they clever and crafty, moving swiftly but in a very methodical and organized manner? Do they see themselves as a martyr? Reversed, this card’s personality is twisted or hidden somehow; perhaps they long to be like the Knight of Swords, but reality stops them. Maybe they are trying to be an ideologically driven person, or perhaps they are being prevented from being a martyr.